Portia La Touche is an emerging artist from California with a strong Asian spirit pursuing the rigorous discipline of traditional Chinese brush painting of ink on rice paper with the energy of contemporary American art aesthetic. Inspiration comes from classic Japanese and Chinese works of art, from the endless wonders in nature, and from the spontaneity of dancing with the brush. The push and pull between Chinese Brush Painting and western-style watercolors creates a positive tension that challenges the artist to continually try new methods and explore different techniques, sometimes blurring the lines between east and west. Traditionally trained in drawing and water media, including watercolors and acrylics, then mastered ceramics and became artist in residence at the Crafts Center, University of California, San Diego. Began studying Asian Brush Painting in the early 1980’s after a trip to Japan to study ceramics. Also skilled in printmaking; produced silkscreened designs for fabrics. Extensive travels to China, Japan, Korea, Thailand, Indonesia, Malaysia, Nepal, and India to study traditional Asian arts and crafts. 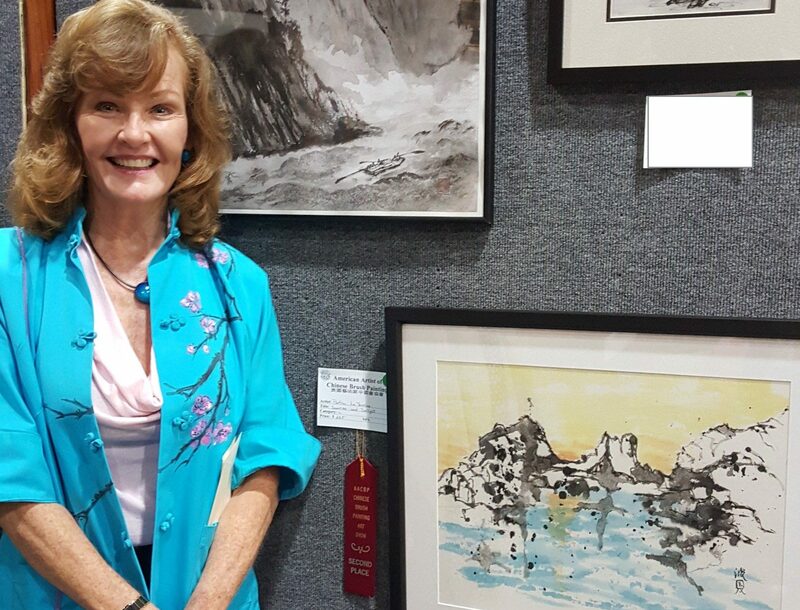 Member of American Artists of Chinese Brush Painting and Chinese Brush Painting Society. University of California San Diego Visual Arts Minor. Studied with David Antin, John Baldessari, Paul Brach, Harold Cohen, Manny Farber, Newton Harrison. Universidad de Madrid European Art History at Museo del Prado, Madrid, Spain. Studied Chinese Brush Painting with Nancy Rupp, Jean Shen, Tom Chow, Rosemary KimBal. Studied watercolor painting with Carol Curtis, Tom Tiedeman, Helen Shafer-Garcia, Lori Mitchell. © 2013 Portia La Touche. | All Rights Reserved All images and text on this website are copyrighted by the artist, Portia La Touche.